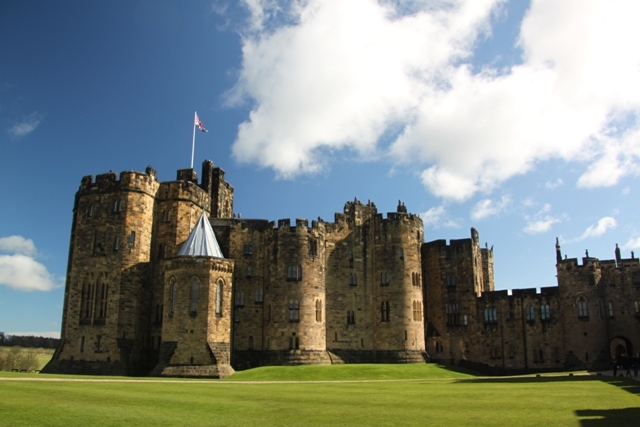 When it comes to castles in Northumberland you are truly spoilt for choice. 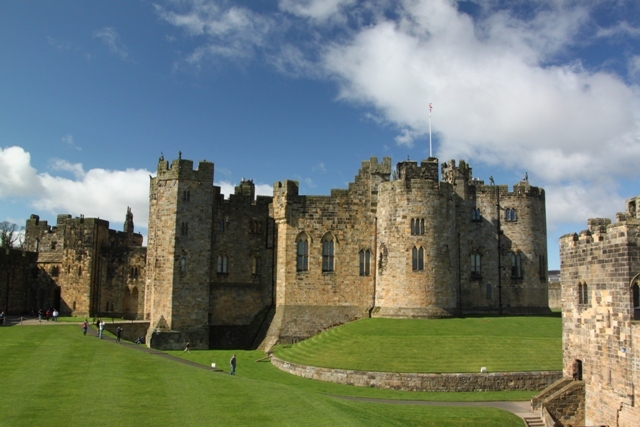 Son’s vote went to Alnwick Castle – all because of a certain wizard by the name of Potter (the first two Harry Potter movies were filmed here). There seemed to be a lot more besides boy wizards to recommend it, so the decision was made and off we went. 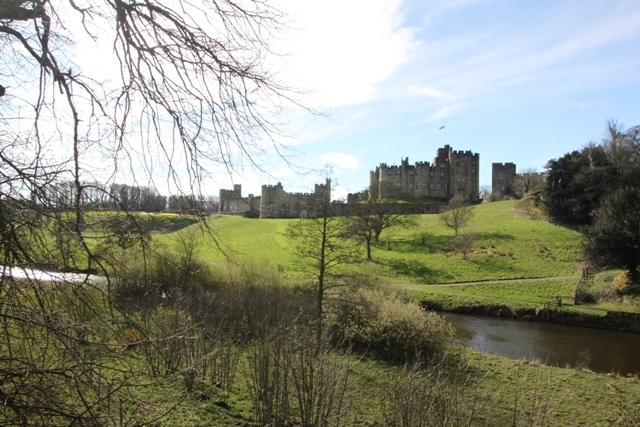 This is the second largest inhabited castle in England, home to dukes and earls since 1309. We found a parking spot on the main road just beyond the castle and wandered down a little hill to admire it from afar. It is a beauty for sure. 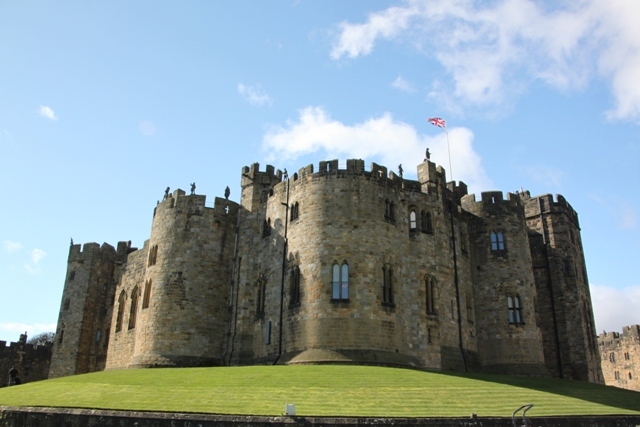 One of Europe’s great fortress castles, it is old, magnificent and easy to see why they call it “the Windsor of the North.” The setting is gorgeous too – rising from the banks of the River Aln and surrounded by rolling green countryside. 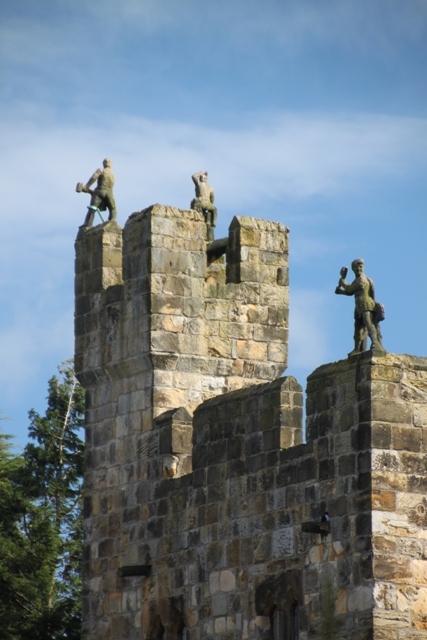 Son was a big fan of the keeps, towers and crenallations and we all loved those figures on top – sometimes referred to as the Duchess’s garden gnomes. Entrance was fairly pricey but we had booked online in advance and saved a little that way. They have an awful lot going on throughout the day, it’s worth spending time picking and choosing when you get inside and planning your day accordingly. 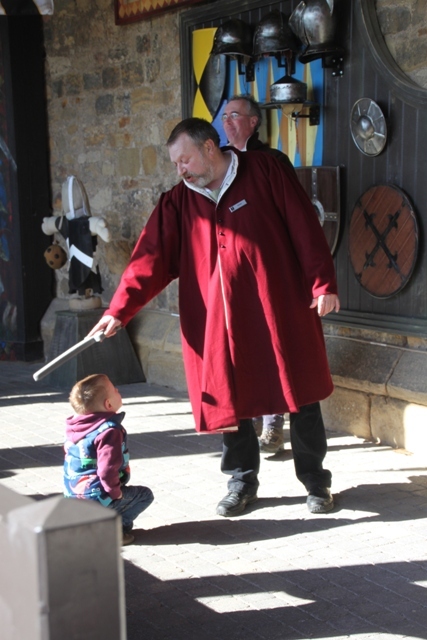 First stop for us was Knight’s Quest – lots of hands-on things for children, from dressing up to being knighted you could even “meet” a dragon. 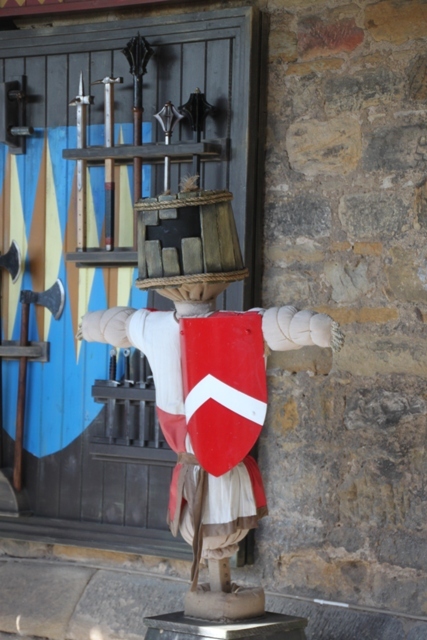 Son played a couple of medieval games and we pelted him with furry rats in the stocks. 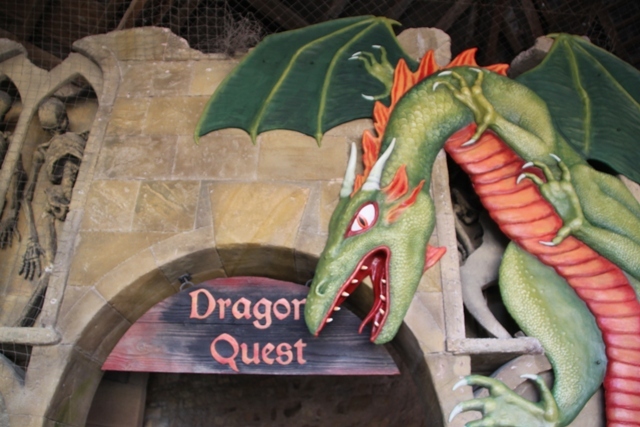 Close by was Dragon’s Quest, a labyrinth designed to teach a bit of medieval history. You walk through a dark area, complete a couple of challenges but we found it all a bit of an anti-climax. A stroll through the inner bailey took us to the main part of the castle. 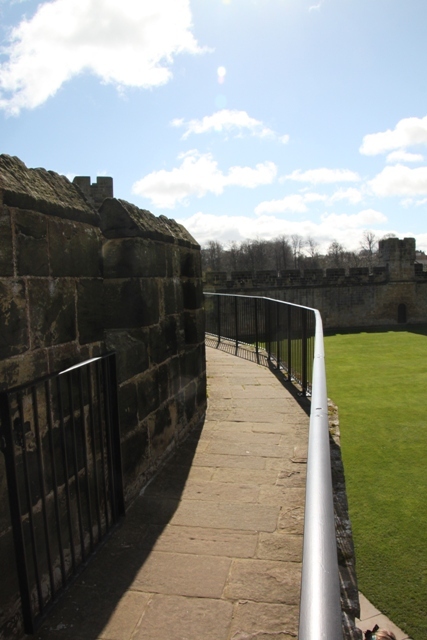 Walls to walk around, cannons to clamber over and glorious countryside – it was fantastic. It’s a great place for kids – oodles of space to run around and let off steam, nooks and crannies and interesting places to explore, steep steps to climb plus any amount of hills to roll down. Son tried all this out and more. Steam well and truly blown off and one (moderately) tired child later we decided it was time to visit the state rooms – one of my highlights of the day. You walk around at your leisure on a self-guided tour, no photos allowed unfortunately. 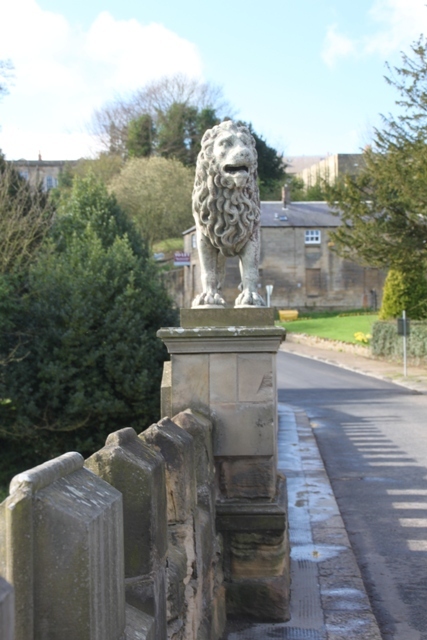 It is opulent and grand, the suites of apartments and state rooms reflect the changing tastes of the Percy family who have lived here since 1309. There are treasures to blow your mind – paintings by the likes of Titian, Canaletto and Van Dyke and that’s just for starters. They also have apparently some of England’s rarest masterpieces of furniture and porcelain. The dining room was amazing – table all set as if guests were due to arrive any minute. I lusted after the library – thousands of books in floor to ceiling cases – sheer heaven. As you walked around past all the grandeur and splendour it was so obvious that the whole building is a family home. The Percys (the Dukes of Northumberland) have personal knick-knacks and photos everywhere in all the rooms. I loved this, clearly this is a home rather than a museum. It makes the whole place just a bit more special. Loving the blog and missing the north a bit! 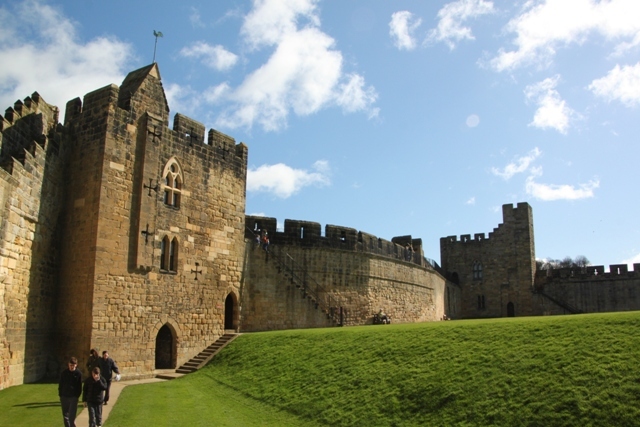 Alnwick is an amazing place to visit. If you ever find yourself down in London, go visit their other house, Syon Park. Very different (Tudor restyled in the Georgian period) but still quite beautiful. Thank you! Thank you also for the tip about Syon Park, just had a look on the website – it looks fantastic and right up our street! Lovely photos. What I found wonderful about the library / lounge room was the corner with the TV, play-station and bean bags, amongst all the leather-bound volumes and grand furniture. As you say, it’s a proper family home. Thank you Margarita. Yes, I loved the fact you could really see the personality of the family and that they lived in these rooms, we’ve been to so many castles and grand places but I just loved this one for that reason. I loved that too. And I remember seeing some of the family coming and going–nice to think that a castle is still a lived in home and not a relic. Only one thing I felt conflicted about–I remember Lady Jane kept a taxidermied dog or two in the library. (Are they still there?) I think she was going for “whimsy,” but every time I think about it my skins crawls a little. I’d love to send little Harry Potter in there with a wand to reanimate those pups and send them scurrying on their way! I read somewhere that she loves taxidermy and has a huge collection of animals! Not my thing either I have to say, don’t get that at all! That looks like a wonderfully interesting castle to visit. We love castles but that is one I have never been to. I will have to add it to my list for when we come back to Britain for a visit. Definitely recommend it – really interesting historically but there’s loads for kids to do as well. Plus if they like Harry Potter it’s an added bonus! My kids and I are all Potterphiles so that is definitely a bonus. When I went there, it was a cloudy day, so I’m happy I can now see through your pictures what mine would have looked like had it been sunny! Thanks! Yes, blue skies make all the difference don’t they! It was icy cold though when we were there. Just beautiful. Spending the weekend there would be a dream. It is a gorgeous place – the most wonderful countryside all around! Harry Potter has certainly given the UK’s tourism industry a big boost! I live close to Lacock Abbey which was also used for some of the Potter films. I have a post on that up my sleeve for when I return from Italy. Never been to Lacock Abbey (but would love to go), so looking forward to your post! I lived in Newcastle for a spell and love and miss the North and good old Geordies. My favorite is Lindisfarne, but Alnwick is a very close second. Never been there but having loved Northumberland so much and already looking at when we can go back Lindisfarne is top of the list! Thank you – it’s a great one to visit if ever you get the chance! That’s one part of the uk I’ve never visited… a shame, that looks so pretty. 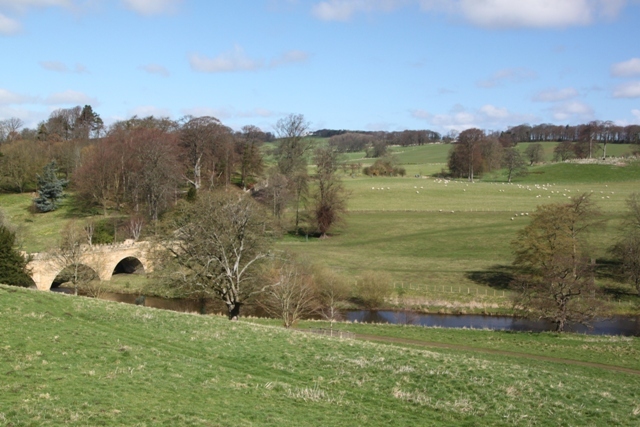 It’s stunning – lovely countryside and so much to see and do – maybe another time…. Beautiful! Showed these shots to my 7-yr-old bc we learned European history and geography last fall and winter. 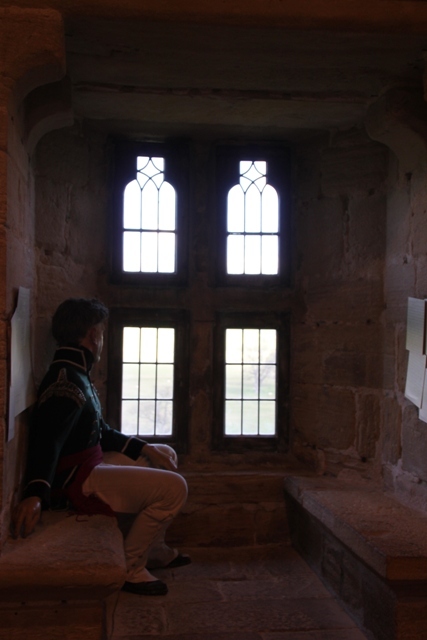 Was that tiny “room” where you could look out where the dukes and princes looked out of, or where the prisoners were? I would imagine the former, as the latter would’ve ended up in the dungeon? 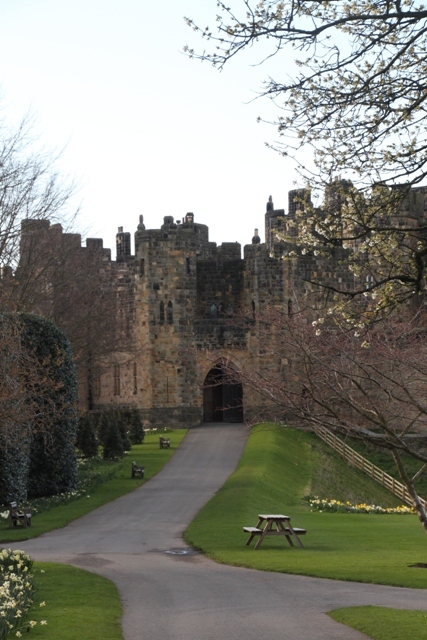 Thank you – it is a wonderful castle to visit with some fascinating history attached. I think that was definitely for the dukes and important people – you can visit the dungeons here as well, the view is not so good and very gloomy. Very cool. And thank you for the follow. =) Welcome to this amazing community of artists and thinkers. Very nice photos. We saw quite a few castles when we lived in Germany for three years. We also had a lot of great wine. We’ve explored a few castles along the Rhine with our son a few years ago – they’re stunning and in Bavaria when I lived there. I know exactly what you mean about the wine too!! Thanks so much for letting me visit this magic place vicariously through you!